Fire officers survey a section of the Notre-Dame Cathedral following a major fire on April 16, 2019. A blaze broke out on Monday afternoon and quickly spread across the building, causing the famous spire to collapse. I have visited Paris many times, studied there, lived there. But I am never “there” until I have paid my respects to Notre-Dame, which is the living heart of Paris. Did you know the city’s mileage indicators give the distance to Notre-Dame? Not to city hall. To Notre-Dame. The first time I saw the Grand Dame of the Seine was in 1963, part of a student-abroad program. I was 18, tired, a little jet lagged. A counsellor asked if I wanted to accompany him to pick up some documents; we climbed on his scooter and off we went into the Paris night. We crossed a bridge into darkness, then suddenly, to my right, floodlights illuminated the façade of Notre-Dame. It was so close. So immense. And so intensely beautiful. All those lifelike sculptures, with their stories, admonitions and blessings, standing out starkly in the Paris night. Memory postcard 1. Years later, in 1976, a friend and I rented a garret room on the Left Bank, overlooking Notre-Dame. The sun emerged from rain clouds just at dusk, its low, warm light flooding the cathedral. Above it, two densely coloured rainbows arched over Notre- Dame. Postcard 2. In 2011, on a dark February day so cold I could see my breath, my husband, son and I slipped in a side door of the cathedral, under one of the massive Rose windows. We entered quietly, to the sound of a male choir intoning Vespers. I see it still: The nave is tall, the vested priest sends a wave of incense past the Rose window. The smell is sweet. The wisps spiral. Song fills the church. We stand in a moment of medieval ritual, our spirits and hearts transported. Postcard 3. I am desolate. How wonderful it would be for something good to rise from this inferno, with differences put aside as the world as one helps to rebuild Notre-Dame. I first saw Notre-Dame at night in winter. Bright spotlights lit both the cathedral and the large snowflakes falling all around it. It was a magical vision, and my wife and I, eyes full of wonder, were drawn across the square. Inside, mass was being said, so we stood quietly at the back with other tourists. At the front, the priest, in a powerful voice, was chanting, and suddenly a large choir backed by a booming organ filled the cathedral with glorious music. It was truly a special moment. Perhaps Canada could contribute old-growth trees from Haida Gwaii for the restoration of Notre-Dame’s roof? A gift from one spiritual place to another. The world’s reaction to the fire that almost brought down a centuries-old stone structure in France clearly demonstrates the pathetic status of the human species of today. Instead of crying and doing something about all the horrendous human suffering and mayhem in the world, we find ourselves crying over an historical, inanimate structure which itself might be surprised by our reaction. We are seeing irony in the making. It is a time of confusion and wonder, when stones maintain more sacredness and sanctity than human life. While we should certainly preserve historic buildings, we ought to put our priorities straight. Late at night in Paris, two Julys ago, I saw the Man in the Moon. 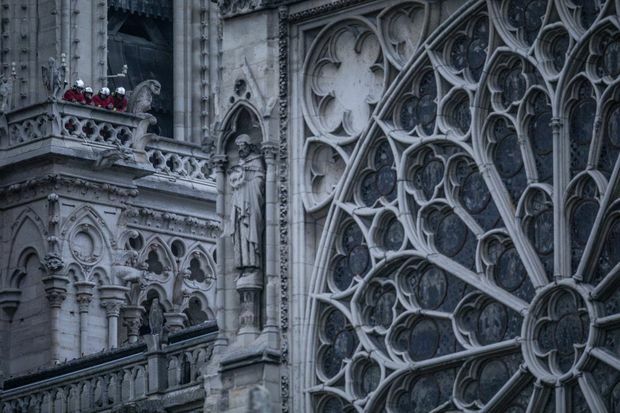 He was staring at the Rose window on Notre-Dame’s southern flank. His rounded lips formed the O of wonder. Late Monday night, walking by High Park in Toronto, I saw him again. This time, the rounded lips expressed the shock of loss. Re Doug Ford’s Carbon-Tax Sticker Shock (editorial, April 17): Doug Ford is compelling gas-station owners to put anti-carbon tax stickers on their pumps, or be fined as much as $10,000 a day. I had been hoping for, and so was pleased to see, an editorial dealing with this. However, I was disappointed that you merely expressed disapproval of this “compelled speech” rather than outrage. I was also disappointed that you ended weakly with it “must be stopped,” rather than strongly, stating how and by whom. I would like to see much more anger about this government’s step in a very nasty direction. Who would have thought it? Stickers on gas pumps, proposed by a Premier whose company makes labels. Kudos for denouncing the Ontario government for forcing gas stations to participate in its partisan carbon-tax disinformation campaign. However, given that burning fossil fuels is driving climate change, which – due to increasing floods, fires, heat waves, droughts, disease, species loss and more – threatens millions of lives, isn’t it time for a different kind of warning on gas pumps: “Using this product as directed contributes to the devastation of our planet and its present and future inhabitants”? Ontario is right to oppose the carbon tax. If the federal government can get away with this intrusion into our daily lives, it might go so far as to require gasoline stations to post stickers defending the tax or face a stiff fine. Re Philpott Considering Running For Other Parties In Federal Election (April 15): Now that she is no longer welcome among Liberals, Jane Philpott is willing to consider favouring the NDP or the Greens with her peculiar brand of loyalty. Jagmeet Singh better watch his back. Ms. Philpott tells us the Conservatives are out of the running, because she has policy differences with them, but as a lifelong New Democrat, I really hope she gives Andrew Scheer serious consideration. She and the champion of ludicrous hyperbole deserve to stroll off into the sunset together. I hope Jane Philpott runs as an independent. We need principled voices like hers, unfettered by party-think. Re Tiger Roars Back (April 15): Was Cathal Kelly watching a different Masters finale? Along with the TSN sportscasters, I said “Wow” many times as Tiger Woods set out to capture golf’s Holy Grail, again. He competed against the best, and won the green jacket again because he was the best. What do his decade in the wilderness, and his personal and professional failings have to do with his consistent, brilliant performance throughout the Masters? Like most people who witnessed his superior play, including the sportscaster, I was enthralled and inspired by Tiger’s mastery. What was Mr. Kelly watching that the rest of us didn’t see?